Water Pump: Heritage Minutes is a one minute duration television film on a Mennonite-designed low tech water pump as part of the CRB Foundation's series Heritage Minutes. Each of these Heritage Minutes illustrate an important moment in Canadian history. The film Water Pump, directed by Kari Skogland, was their 51st minute and first broadcast in 1995. In 1991 the charitable CRB Foundation (now known as Historica Canada) began broadcasting these Minutes on Canadian Broadcasting Corporation (CBC) and CTV and also in some film theatres. They were made in both English and French and narrated by Patrick Watson. The Water Pump illustrated how a Canadian Mennonite devised simple water pump is modified to aid in bringing clean sustainable water to needy of the Third World. 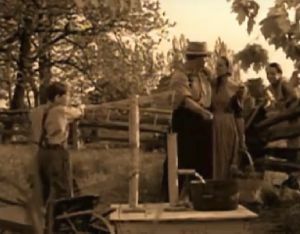 The Historica Canada website describes the Water Pump film in these terms: "From a Mennonite farm in Ontario and through a Canadian university laboratory to villages throughout the developing world, the spread of the Waterloo hand pump is one example of how Canada takes a leading role in constructive global change." The Canadian International Development Research Centre (IDRC) commissioned Professors Alan Plumtree (mechanical engineering) and Alfred Rudin (chemistry) of Waterloo University in 1978 to design a hand pump that would be able to endure very heavy daily use. It also had to be inexpensive, manufactured locally with local materials available in poor developing countries and yet able to be maintained with limited materials and basic hand tools. In response the researchers visited Waterloo area Mennonite farms to observe how they manage to develop a safe water supply without advanced technology. From them they learned a working Mennonite philosophy that embraced resourcefulness and simplicity. Mennonite farmers in the Waterloo area of Ontario had been using a practical, reliable hand pump for generations. This Mennonite pump became the basis for the researchers' design. Researches then modified the design by making some parts from non-rusting inexpensive polyvinyl chloride (PVC) and others of leather. The final design is known as the Unimade Pump. In time over a million people in thirteen different countries now use this pump for supplying their clean water. These Heritage Minutes were also released as Radio Minutes with audio only for radio broadcast. Wiebe, Victor G.. "Water Pump: Heritage Minutes (Film)." Global Anabaptist Mennonite Encyclopedia Online. December 2017. Web. 22 Apr 2019. http://gameo.org/index.php?title=Water_Pump:_Heritage_Minutes_(Film)&oldid=163221. Wiebe, Victor G.. (December 2017). Water Pump: Heritage Minutes (Film). Global Anabaptist Mennonite Encyclopedia Online. Retrieved 22 April 2019, from http://gameo.org/index.php?title=Water_Pump:_Heritage_Minutes_(Film)&oldid=163221. This page was last modified on 13 February 2019, at 18:34.